A new research report by Persistence Market Research presents an overview of the global egg powder market. The report is titled ‘Egg Powder Market: Global Industry Analysis 2012-2016 and Forecast 2017-2025’ and it lets you understand the market from beginning till the end, with the help of a systematic report structure and data representation. The report includes every part of the market analysis, from market value, Y-o-Y growth, pricing analysis, and forecast for the projected period. Another major section of the report covers a brief on the drivers driving the market growth, restraints that are limiting the market and also the trends governing the market. This comprehensive research report is intended to assist the people and answer all the queries pertaining to the global egg powder market. This comprehensive research report involves an extensive primary research that includes identification of key players in the market. The research report covers all the key players in the global egg powder market with their complete profiles. These profiles depict the current developments of these companies as well as the upcoming market strategies that may also impact the global egg powder market. This section of the report can help the market players understand the strategies of their competitors and also help new entrants study the current market structure so that they can plan effective counter strategies for emerging successful in this market. Why you should invest in this research report? This elaborate research study covers every aspect of the global egg powder market and presents it to the readers in the form of a systematic and well-structured report. This report includes all the main statistics of the market analysis, which also assures accuracy as it goes through different levels of validation. The report is based on the key insights of the market given to the analysts by industry experts. The data that they provide adds value to this research report to a great extent and the actionable intelligence that the report provides enables key stakeholders to understand the market in detail and devise strategies capable of strengthening their foothold in the global market. Egg powder includes powder made from bird eggs, and these are fully dehydrated eggs. It also known as dried egg products that include whole egg powder, egg yolk powder, egg albumen powder, and egg powder mix or a blend of egg powder. In the food industry, bakery and confectionery are the major segments that account for a higher demand, followed by meat products and sauces & dressings. The food segment accounts for a significant revenue share in the global egg powder market, and is expected to register a high growth rate during the forecast period. Currently, the demand for egg powder is also rising among personal care products, cosmetics, animal feed, and pet food products. According to this research analysis, the global egg powder market is expected to be valued at over US$ 840 Mn in 2017, growing at a CAGR of 4.5% during the forecast period 2017-2025. 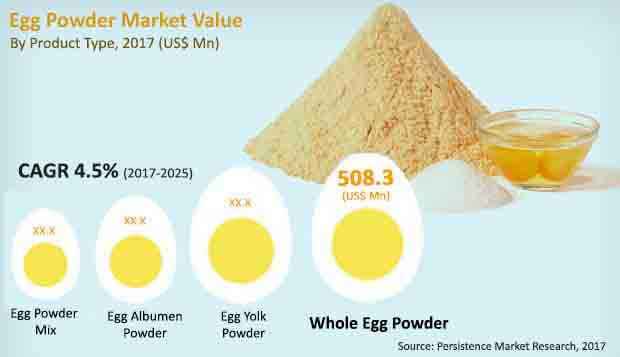 Among the different product types, the whole egg powder segment is anticipated to dominate the global market in terms of revenue share, with a projected value share of about 60% throughout the forecast period. Over the past decade, developing nations such as Brazil, Argentina, Chile, and other such countries around the globe encountered a huge shift in consumption patterns, from carb-based food (such as grains, cereals, and rice) to protein-based foods (such as hens, fish, meat). This factor is expected to fuel the demand for egg powder in Latin America, thereby resulting in an expansion of the animal feed industry in the region and driving the demand for egg powder. The growth in demand is also helped by a marked increase in the production of eggs. Asia Pacific accounts for more than 40% of the global egg production and China holds the largest share within the APAC region. Owing to the high production in this region, manufacturers are focused on processing eggs into egg powder to cater to the rising demand from the food industry. This factor is expected to drive the sales of egg powder over the forecast period. These factors have a direct impact on the application of egg powder. Egg powder is experiencing increase in its use, especially in the bakery industry. Eggs are one of the important ingredients in most bakery products, and are used extensively across the globe. Bakers prefer to use egg powder instead of whole eggs, owing to multiple reasons such as longer shelf life and ease in shipping and transportation. The North America bakery industry is around US$ 32 Bn, which holds the second position after Europe. The increasing demand for healthy bakery products across North America is expected to drive the demand for egg powder across the region. The research analysis has observed various factors that may contribute to the sluggish growth of the global egg powder market. One of those factors is high risk of contamination associated with eggs and egg powder. Owing to poor hygienic conditions, there is always a risk of contamination in eggs, which would possibly degrade the quality of eggs and processed egg products. This factor is expected to hamper the growth of the egg powder market especially in Asia Pacific over the forecast period. The report also shows a negative impact of the fluctuations in the price of raw materials. Increased prices of agricultural grains used as feed for hens within the region has led to an increase in the prices of the production of egg powder, which has detached the low income families from the consumer chain, and is expected to further degrade the growth of the egg powder market.